Helen Shepherd (nee Ashby) sent the following three photos, showing her dad Bill Ashby and also the family's lorry. Helen also sent also four St George's School photos. 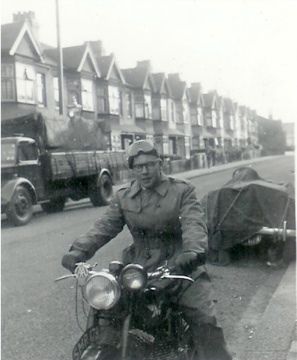 This is my dad Billy Ashby in about 1951 when he was doing his National Service in the Royal Air Force. You can see the firm's latest lorry parked opposite, I believe. This was taken in Greet Road (now the site of a tower block). I can remember riding in his lorry with my dad when I was small (I was born in 1967). The lorry was kept in a garage in Albany Road. 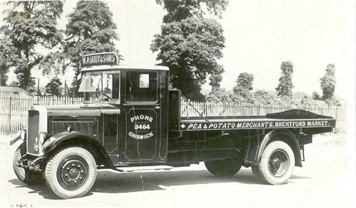 My great-grandfather's lorry. I don't know the date of this photo, but would guess at 1920s or 30s. You can see 'Pea and Potato Merchants, Brentford Market' painted on the side and 'W.J. Ashby & Sons' above the windscreen. There is also a Chiswick 'phone number on the passenger door. This is my dad working at the Market - I would guess in the early 1970s. He was the third generation of William Ashby to work in the firm, although after his dad Bill died, he worked for his uncles Arthur, Charlie and Albert. 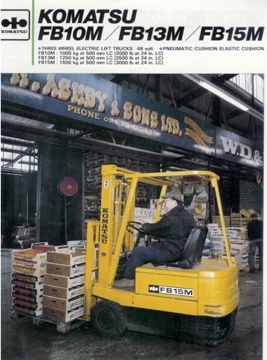 He was approached by Komatsu to see if they could photograph him on the front on a brochure for one of their fork-lift trucks. We joked that he was famous, but thought it was a shame that they never paid him for the privilege!